Parabolic Arc would like to extend belated birthday wishes to Frank Borman and Jim Lovell, who both celebrated their 90th birthdays this month. Lovell’s birthday was Sunday, and Borman celebrated his latest trip around the sun on March 14. The two nonagenarians, who were crew mates on Gemini 7 and Apollo 8, are the oldest of the surviving Apollo astronauts. The rest of their compatriots are all in the 80’s. Borman and Lovell spent nearly 14 days aloft aboard Gemini 7 in December 1965. The flight proved that astronauts could survive trips to the moon and back. During the flight, the spacecraft rendezvoused and flew in formation with Gemini 6, which was piloted by Wally Schirra and Tom Stafford. The rendezvous was also a first for human spaceflight. Borman and Lovell teamed up again in December 1968 for the first manned voyage to the moon. Along with Apollo 8 crew mate William Anders, the astronauts made 10 orbits above the lunar surface, paving the way for eventual moon landings. The mission proved to be the last spaceflights for Borman and Anders. Lovell would go on to command the ill-fated Apollo 13 mission, which had to abort a landing in the Frau Mauro highlands due to an explosion in the service module. Lovell, Fred Haise and Jack Swigert used the lunar module as a lifeboat. March 17 — Ken Mattingly, Apollo 16 — 82. The table below shows the Apollo crews who flew in the lunar, Skylab and Apollo-Soyuz programs. 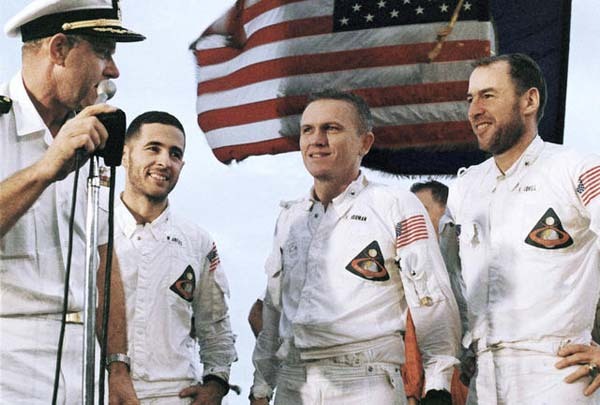 Although some astronauts died relatively young, many of them survived into their 80’s — a tribute to the superb conditioning required by NASA and the military services in which they served. Of the 12 men to walk on the moon, five are still alive: Buzz Aldrin (Apollo 11), Bean (Apollo 12), David Scott (Apollo 15), Charlie Duke (Apollo 16), and Harrison “Jack” Schmitt (Apollo 17). Their birthdays fall on the same date as the 50th anniversary of Gagarin’s death. It’s a mystery surrounding the last year of his life. Was Gagarin an alcoholic by then? Soyuz 2 to use it as a ‘space tug’ to boost him into the Van Allen Radiation Belt? Happy Birthday to both of these American heroes. Congratulations and Happy Birthday to both Col. Frank Borman and Capt. Jim Lovell!